Jincheng Yang. Photo by Kyle Dykes/UC San Diego Health. Doctorate of pharmacy graduates typically follow paths that lead them to a career as a pharmacist in a hospital or community pharmacy, or as a researcher in academia or a pharmaceutical company. For Jincheng Yang, a student in the Skaggs School of Pharmacy and Pharmaceutical Sciences at UC San Diego, it’s a tough choice. To help find his path, Yang has become the first Skaggs School of Pharmacy student to take advantage of a new fellowship funded by Janssen Research & Development, LLC (Janssen R&D), one of the Janssen Pharmaceutical Companies of Johnson & Johnson. He’s taking a year off between his second and third years of pharmacy school to try his hand at research that bridges both academia and the pharmaceutical industry, while making a difference in global health. This academia-industry partnership is specifically aimed at addressing neglected diseases and underserved patient populations. Yang is spending the first half of the year working with Edmund Capparelli, a professor at UC San Diego School of Medicine and Skaggs School of Pharmacy, and Dr. Mina Nikanjam, a visiting hematology-oncology fellow from UCLA Health. He’ll spend the second half of this year working on a related project at Janssen R&D. Yang uses various computer programs that simulate organ systems in the human body. With these tools, he investigates Kaletra, a first-line medication for pediatric HIV, dosing in infected children—typically an underserved patient population, particularly in developing countries. Yang’s work is known as pharmacokinetics, or the study of how a medication moves through the body—how it’s distributed, absorbed, eliminated, and everything in between. A drug’s pharmacokinetics determines how much you need to take in order for it to work as well as possible, while minimizing harmful side effects. Drugs have their own characteristics that influence pharmacokinetics—such as the type of compound it is, or whether it’s a capsule, tablet or liquid—but so do patients. How old you are, how much you weigh, how well your kidneys work, all influence how long a medication stays in your body, how it’s distributed and how it’s cleared away. For example, drugs are often metabolized much more slowly in older adults than in younger people. Doctors and pharmacists can plan for some of this and adjust their dosing recommendations accordingly, but pharmacokinetics can differ greatly from person to person. Determining the best amount (or dose) of a drug to give a person is especially tricky for children, where pharmacokinetics are rarely tested. “Initial pediatric dosing recommendations for drugs to treat HIV and other global diseases are often generated from small studies that measure drug levels in just a few infants and children from the U.S. and Europe,” Capparelli said. That’s why Capparelli’s lab often works with the World Health Organization (WHO) to find the best methods to determine HIV and other medication dosages around the world, particularly in regions that lack access to expensive pharmacokinetics tests. As larger pediatric studies are performed that also include patients from Africa, Asia and Latin America, Capparelli’s team incorporates drug level measurements into their computer simulations. “We use these pediatric pharmacokinetic models to optimize dosing strategies and help improve how pediatric drugs are used across the world,” Capparelli said. Yang uses Phase I-IV clinical trial data available from multiple sources, including International Maternal Pediatric Adolescent AIDS Clinical Trials (IMPAACT) Network, a global collaboration of researchers who are treating and preventing HIV in what are often considered neglected populations in this patient group—infants, children, teens and pregnant women. 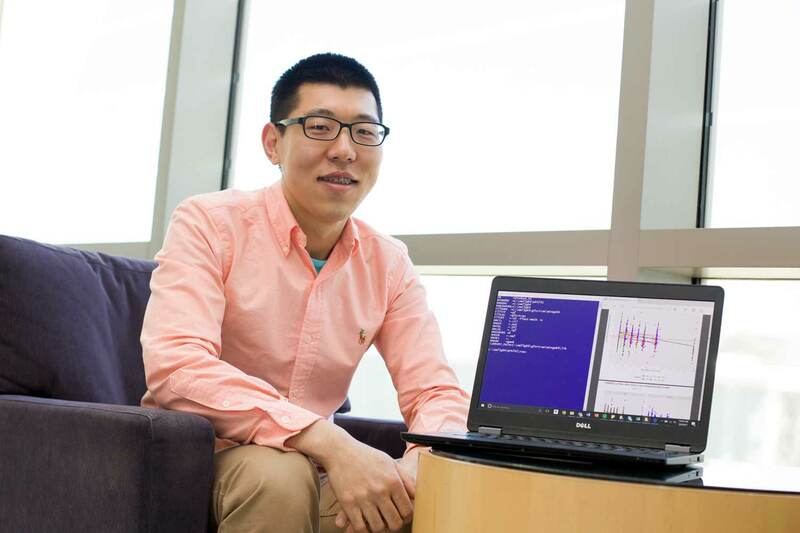 Yang runs this data through existing computer models, but also builds on them using his own programming skills. “I’m lucky to have this opportunity — it’s rare to find pharmacokinetics in academia,” Yang said. According to Dr. James McKerrow, dean of the Skaggs School of Pharmacy, this post-sophomore year research fellowship is modeled on similar programs commonly found in medical schools and other degree programs. McKerrow and his own research team are also collaborating with Janssen R&D to find new therapeutic targets for another neglected disease—Chagas, a parasitic infection that is the leading cause of heart failure in Latin America. As part of this partnership, Janssen R&D provides McKerrow and team with funding and access to their “Jump-Starter” screening library of compounds. Access to this library helps McKerrow and team search for chemical probes for studying Chagas disease and aids the discovery of compounds that might treat it. In the past year, McKerrow says they’ve already identified a number of promising compounds that are being evaluated and prioritized at Janssen R&D. The next step will be to test the compounds in animal models of Chagas infection to see if they are safe and effective.